Player Adventure - The DrBlowhole EditioN! Fri, 07/26/2013 - 03:55 — Johny L.
Note: This is the game before the events of The Player Aventur. Prepare for a madness of black & white screwup with the new Player Adventure edition based from Black Squirrel's classic Player Adventure! + over 20+ missions with challenging stuff! + The Q and R missions are back! This time they got a change. + Save the Dragoon of mystery from being dead! + New black and white monsters you'll encounter during the game! WARNING: Like Player Adventure, this game contain flashing lights, window control abuse and even some other crap which makes your eyes hurt, play at your own risk and watch out. 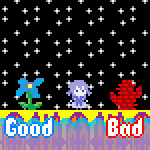 - Removed the Secret levels, it was a scrapped idea. - Fixed the last route's redirection to the final level.